The purpose of this page is to showcase Koorey Creations' wonderful new designs. For your shopping convenience, we have added pricing on these pieces. We are not a company that is "internet competitive" on pricing overall, as our process is custom, labor intensive and quality manufacture. Because of this, our website is geared primarily for customer convenience for existing KC customers. And, for those who would like to consider us for future purchases or are in need of more information. Currently, we operate two retail facilities, and prefer the Personal Touch whenever possible. Even so, we offer this page to our regular shoppers that have requested more frequent updates on new designs and enjoy the web experience when a physical visit is not possible. 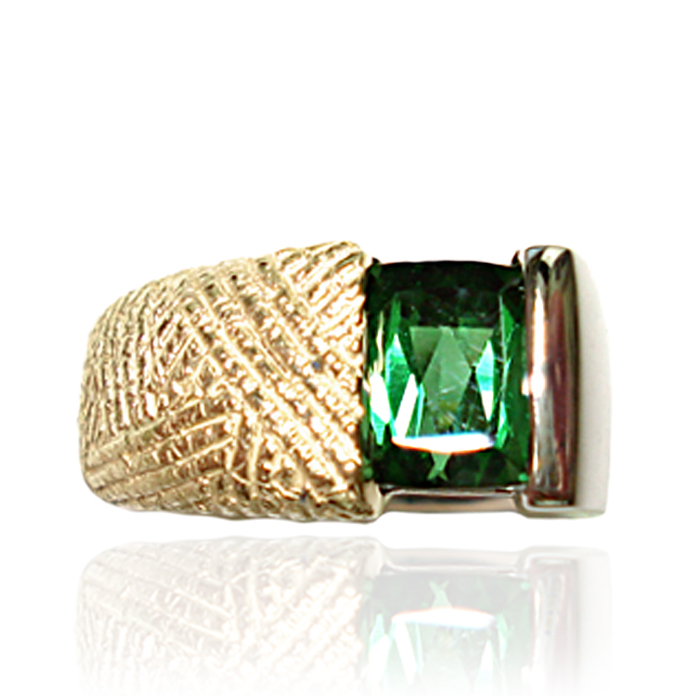 PRODUCT NOTES: Ring sales generally include free sizing within 2 sizes up or down. We show chains for sale on the Pendants page, and can provide pricing for the length you need at the point of sale. We ask that you visit the Path to Purchase page to contact us with general or purchasing questions – we're always happy to assist you. All items come with a complete appraisal (2 copies), photographs, and in some cases, a Koorey Creations Authenticity Report with notes about the Koorey Creation family of artists. Care instructions will be included with any colored gemstone purchase, as well as noting any enhancement on the gemstone itself. 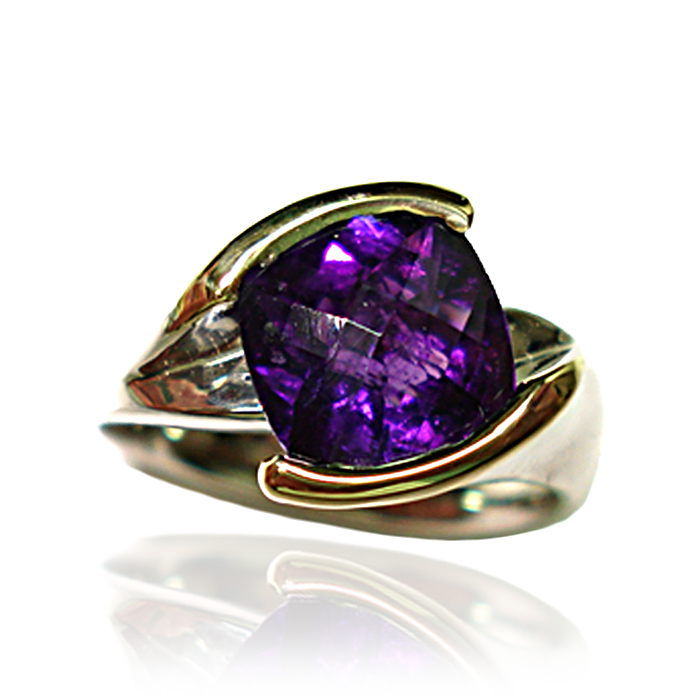 “Alluring Amethyst” Ladies Ring. Cushion, checkerboard cut dark purple Amethyst, measuring 2.20 carats and 8.×8.2×5.7 millimeters, channel set in 14 karat white and 18 karat yellow gold. Spinel “Elegant Channel” Ladies Ring – Our signature “Elegant Channel” design steps into the purple zone with the addition of a 2.42-carat Spinel, channel set into 14 karat white gold. This dark purple beauty shows strong saturation, tone and light return. Six channel set round diamonds, .18 total carat weight with an SI clarity and G-H color, accent the dark purple of the Spinel. 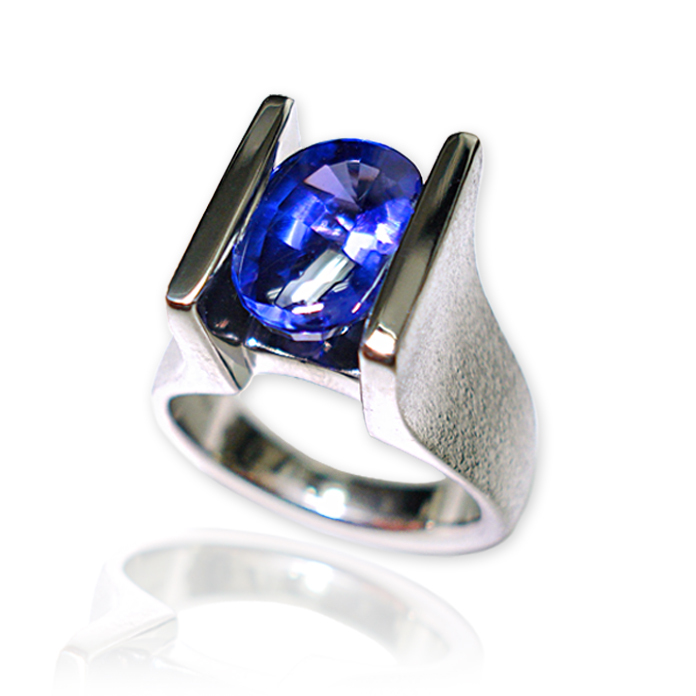 Straight Channel Tanzanite ladies ring — Buff top, oval deep blue Tanzanite, 3.12 carats, 11x7x5 millimeter, set in 14k white gold. Sapphire “E-Loop” – Our ever-popular signature “E-Loop” design takes on the cool blue of a 3 carat Ceylon Sapphire in this modified version of one of our favorite custom designs. 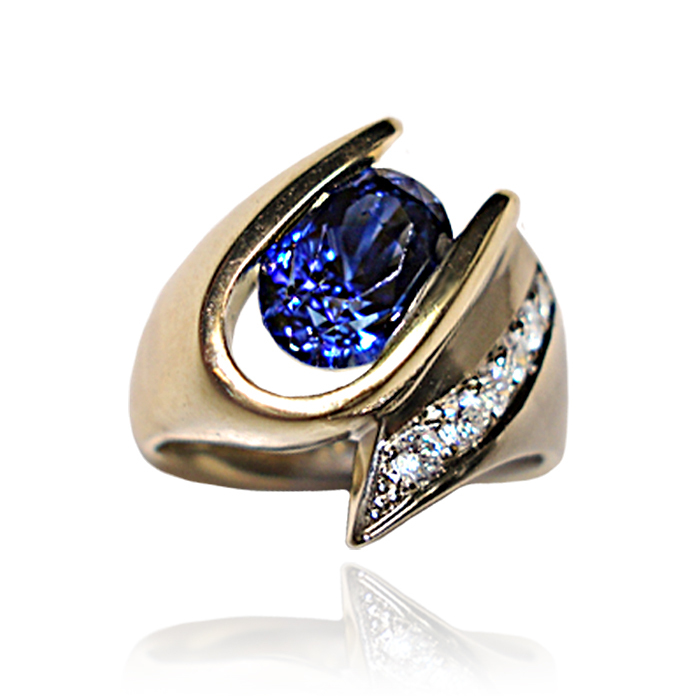 The Sapphire is channel set in 18 karat yellow gold and 14 karat white gold and gets a bit of bling from 6 round melee diamonds, .18 total carat weight, channel set into the side of the ring. 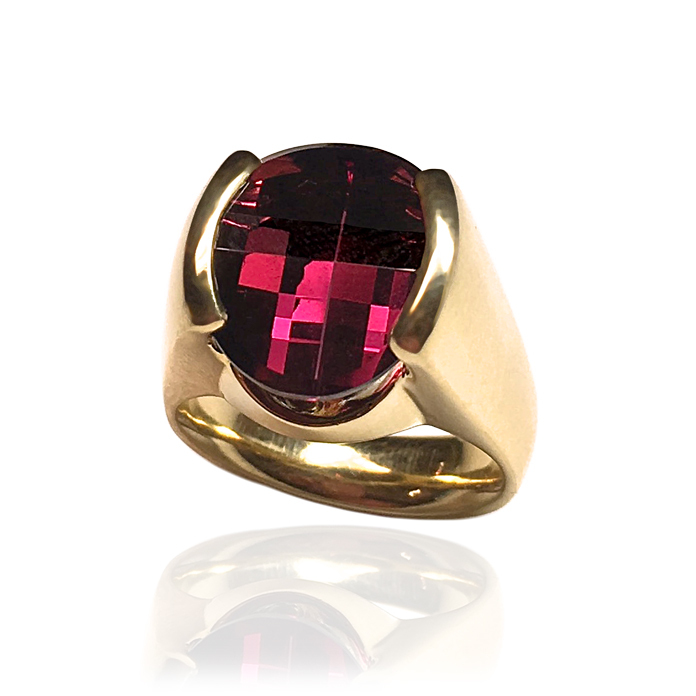 “The Rose” – Straight channel 18k yellow gold ladies ring with a spectacular “OVOB” patented cut 12.17-carat Rhodalite Garnet by award-winning cutter Stephan Avery. This color Garnet is extremely rare. “Aqua Marquise” Ladies Ring – Set in 18 karat yellow gold this 2.46 carat, medium green-blue marquise cut Aquamarine is elegant and delicate. 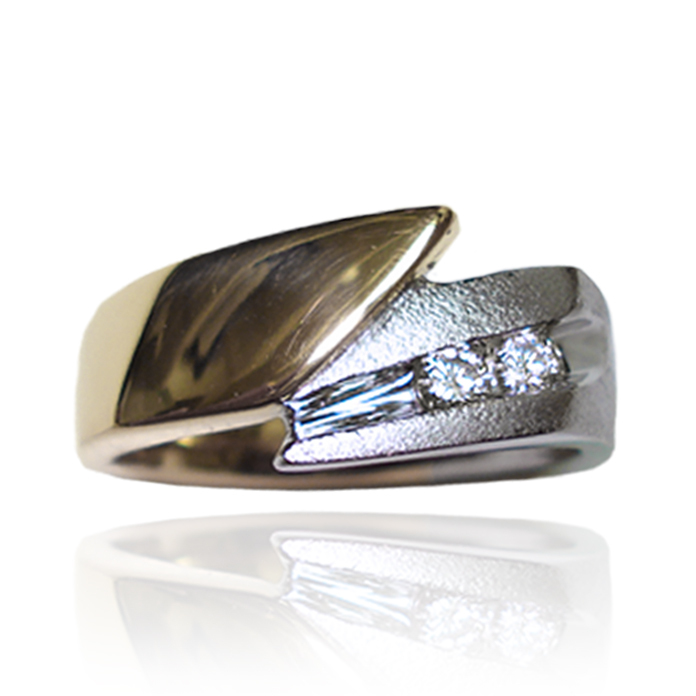 The engineered channel setting with a bold V prong protects the stone from wear. 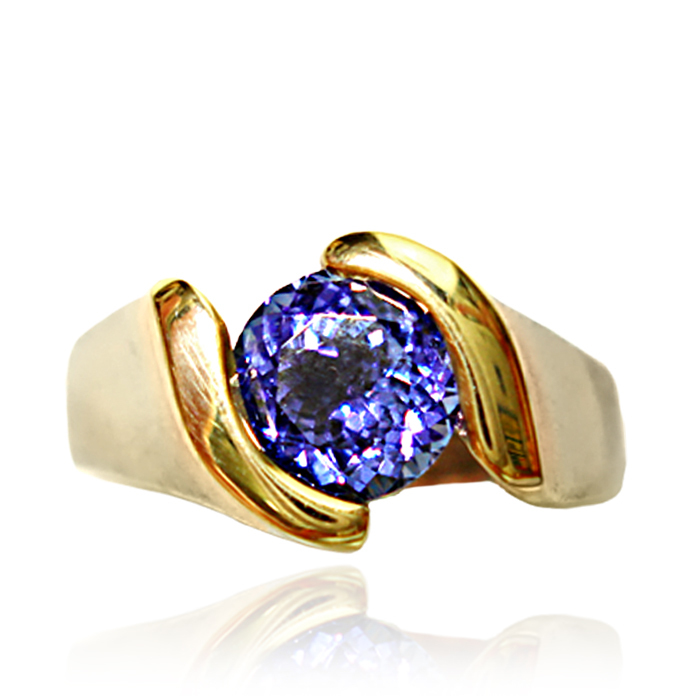 Tanzanite “Elegant Channel” Ladies Ring – Set in 18 karat white gold with 14 karat yellow gold around the stone this 1.08 carat round Tanzanite is a show stopper for all blue lovers. The boldly engineered channel setting highlights the stone’s violet-blue color while keeping it safe. “Trillion Perfection” Ladies Ring – One of our most difficult settings takes center stage again with a .78 carat, 8.6-millimeter, diamond. 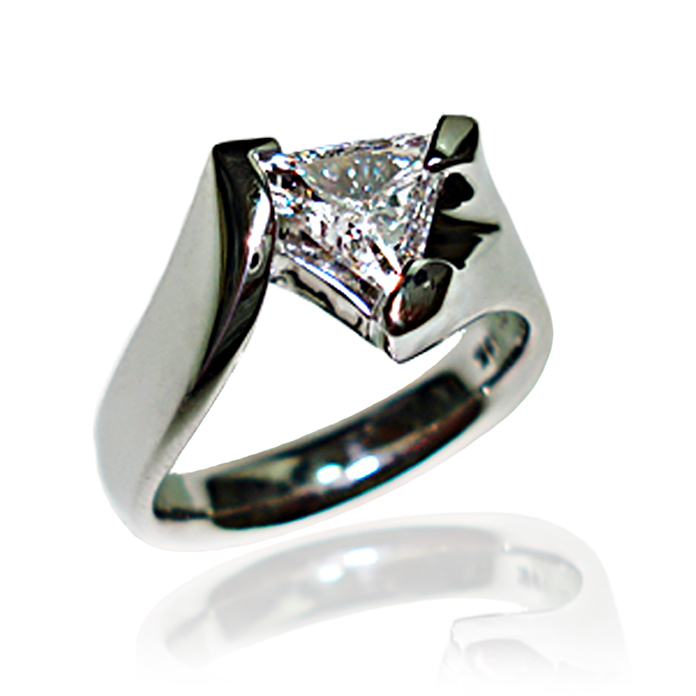 The diamond has a VS2 clarity and E color and is set in 14 karat white gold. A show stopper. “Aqua Whirlpool” ladies pendant — Marquise cut Aquamarine, 2.50 carats, set in 14k yellow gold. Shown on an Italian Twisted Omega, 14k yellow and white gold. Available in 17”, 18” and 20” lengths. “Boulder Sweep” Pendant. 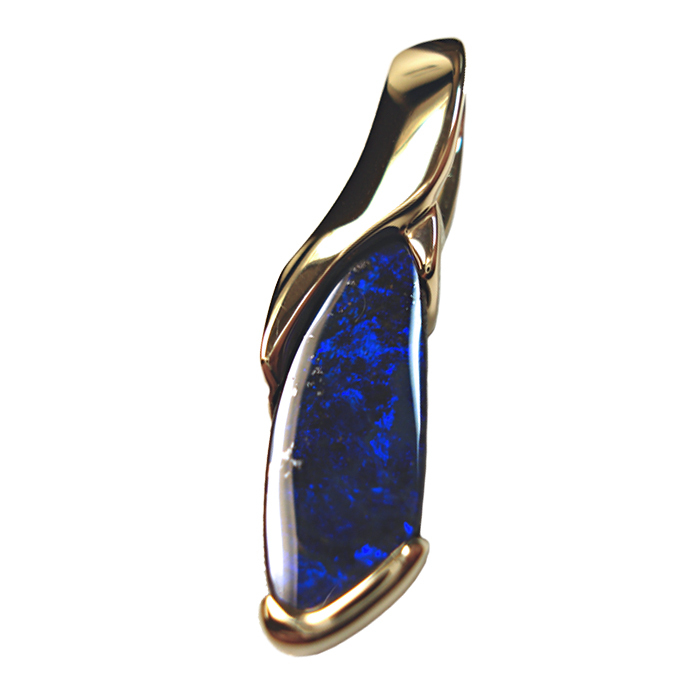 Custom designed, one-of-a-kind Australian Boulder Opal pendant featuring a hand-cut, intensely-colored violet blue opal, 18x7x2.5 millimeters, partially channel set in 18 karat yellow gold. “Ammolite Color Storm” ladies pendant — Vibrant Ammolite, 33.2 carats, set in 14k yellow gold. Shown on an 18 inch, 14k yellow gold, 4-millimeter Classic Convex Omega. “Sunset Adventure” Ladies pendant. 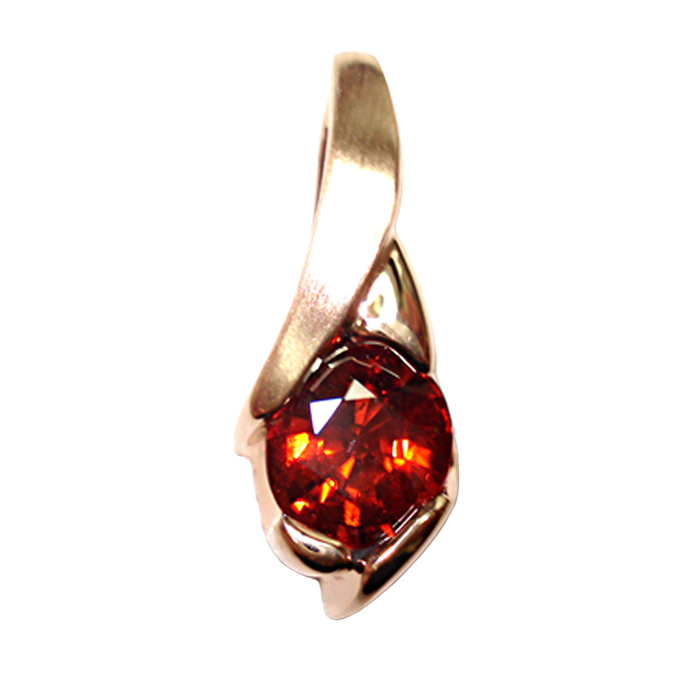 Unusually colored dark red-orange 3.15 carat oval Spessarite Garnet, channel set in warm 18 karat peach gold. “Sunset Salute” Pendant. One-of-a-kind channel and bezel set Australian Boulder Opal set in 14 karat white and 18 karat yellow gold. This multi-colored opal is accented with a dark red-orange Spessartite Garnet, 1.60 carats, and one round brilliant cut diamond weighing .11 carat, SI-1 clarity and G color. “Golden Drusy” — Black Drusy Onyx, 31x15x5 millimeters, colored with 18k yellow gold in a one-of-a-kind 14k setting. 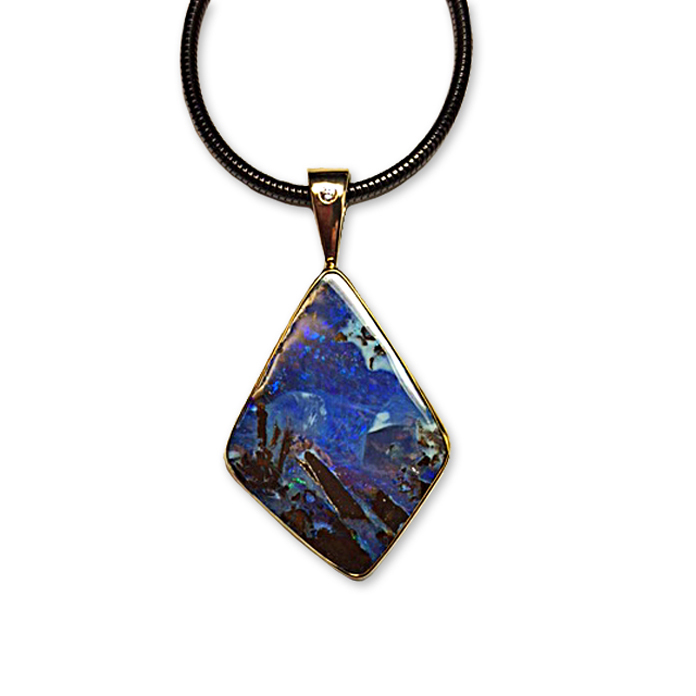 “Mountain Night” – Dream-like Australian Boulder landscape opal pendant hand-fabricated in 14 and 22k yellow gold. One diamond weighing .03 carat. “Deep Sea Depths” Pendant – This custom, one-of-a-kind pendant design features a unique channel and modified prong design with a modern flair. 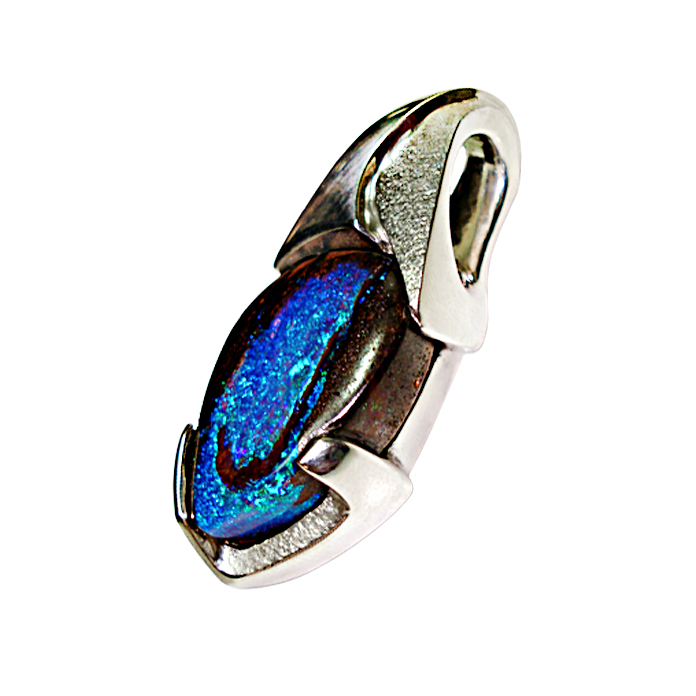 The sterling silver setting holds a hand-cut Australian Boulder Opal, measuring 30.13cts and 24x17x8.9 millimeters, in violet blue with blue and green pinfire play of color opal flash, seen from all angles. The setting has a “sharkskin” matte finish.